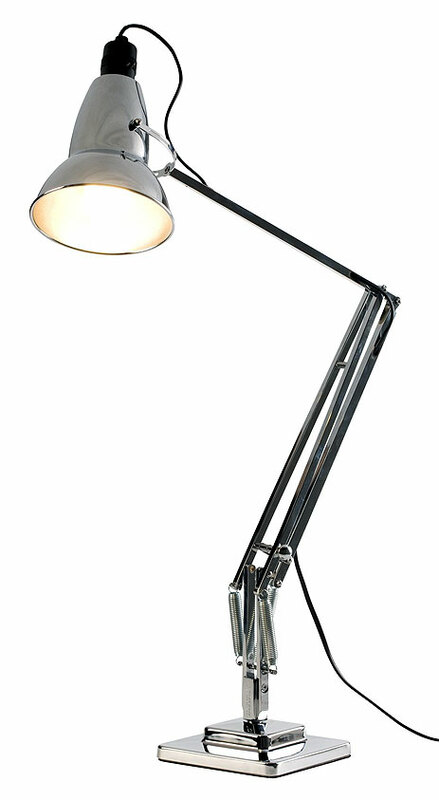 Anglepoise Lamp another classic design vote for yours! 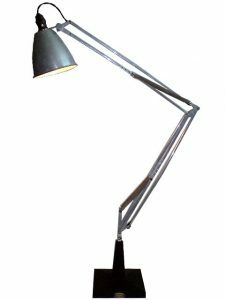 The Anglepoise Lamp (or should I say the Anglepoise 1227) has become over the years a timeless British designed icon and copied countless times, so much so I guess many haven’t seen a real Anglepoise Lamp, let alone a 1227. 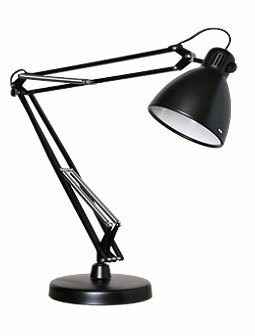 Many may believe they have seen an Anglepoise lamp in Pixar animations, but they would be wrong. The light featured in the short animations is a Luxo light, ironically a modified version which has sold many more than the ‘original’ task light created by George Carwardine. So what about the real Anglepoise lamp? The first Anglepoise was designed by George Carwardine in the early 1930’s. George an engineer in the Automotive industry had become Chief Designer for Horstman Car Company. Being an engineer/designer and always working on drawings that required fine detail, George realised that there was a need for directional light an adjustable lighting system that could direct the light at the place he was working. With his engineering brain he began to develop a system of holding a light, with an effective frictionless mechanism, a system that didn’t require the tightening of nuts and bolts, instant light where you needed it, with no faff. He soon understood that such a mechanism would require springs, to counterweight the head and arm of the lamp, much in the same way the human arm works by using muscles. 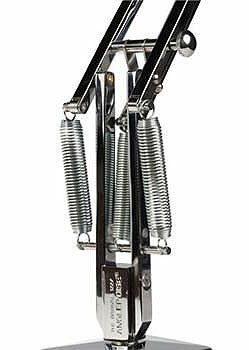 The springs he used where also his patented invention, originally invented to be used in cars back in the 1920’s. The spring called the equipoising spring were unlike ordinary springs as the are able to stay in a fixed position after being moved, as well as moving in virtually any direction. The design of the lamp and the way it’s engineered, do resemble the way a human arm works but although claims are made to the contrary this was never Carwardine’s sole intention, he started with springs and worked out – function first! Add to the brilliant frictionless engineering, a bonnet like lampshade and a solid base, the lamp takes on a strangely human posture, almost like a mother stooping to tend her children. Carwardine applied and was granted a patent in 1932 for a lamp design using the mechanism and manufactured the lamp himself in the workshops of his own company. Interestingly the first Anglepoise produced by Cardine Accessories Ltd (stamped on the base), is probably the rarest of all Anglepoise’s. That said it wasn’t the famous 1227 design that we know today in fact it looked quite different having four springs and a different construction. Demand soon outstripped supply, so in 1934 Carwardine in need of a partner, turned to the spring company that made the springs, the Terry Spring Company. The Terry’s licensed the design, manufactured, marketed and supplied the lamp, all the while Carwardine continued to develop the concept of holding an object on a frictionless mechanism. Carwardine produced a number of other versions and applications, such as microphone stands, copy holders for typists and the such like, his focus though was on invention for function, solving problems. Although demand was high enough for the first lamps the feedback was that it was a little industrial for the domestic market, an area that Terry Spring Company wanted to exploit. Carwardine was asked to take another look at the lamp design and in 1935 the 1227 Anglepoise we know today was born. This revolutionary design was hugely popular and quickly became an iconic British design classic. Although the Terry Spring Company continued to manufacture the lamps, the license for the patent wasn’t too well guarded. Instead of keeping the license for themselves they sold it to numerous people, one of which was a Norwegian textile machinery importer called Jacobsen in 1936. The license allowed him to produce and market the lamp in every country outside the British Commonwealth, he modified the design and created the Luxo light. Luxo is now an international group with revenues in excess of £50million. Ironically it’s the Luxo light that appears in the Pixar animation and the Luxo light that has sold over 25 million units throughout the years. The Anglepoise 1227 is still sold today and the company still owned by one of the Terry’s. Anglepoise is a 75 year old British company who hold the patent for the original 3 spring task light, and now defines itself as a Personal Mechanical Motion company, not a lighting company. Today they highlight differences between the Anglepoise and the rest, highlighting the quality of their items and greater functionality. All the same the story of the humble light, as with many products isn’t straight forward and once again shows that a good creative mind doesn’t always guarantee the financial rewards.